These tender homemade raised muffins are the cat's meow. Add sugar and butter to scalded milk. When lukewarm add yeast. When yeast is proofed (20 minutes), add well beaten egg. Add proofed yeast mixture gradually to 1 cup flour, blending well. Cover and let rise in a warm place until doubled in size. PREHEAT oven to 425 degrees. Grease muffin tins. Add the rest of the flour and salt sifted together. Mix well. Drop from spoonful into the muffin tins, filling about 1/2 full. Cover and let rise until doubled. Bake for 12 minutes. While muffins are baking, place melted butter in a bowl. 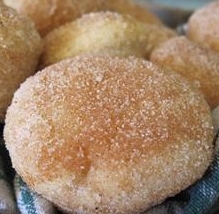 In a separate bowl, mix together 1/2 cup of sugar with the cinnamon. Remove muffins from their cups, dip each muffin in the melted margarine, and roll in the sugar-cinnamon mixture. Let cool and serve. Mix together and dunk the tops. Add more milk if the consistency is too thick.